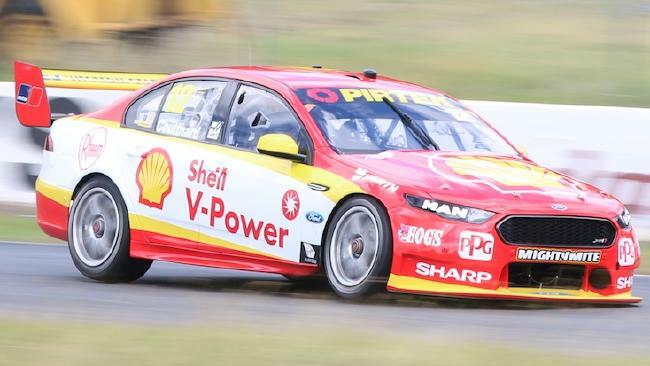 SCOTT McLaughlin suffered a start-line shocker as Ford's forgotten man Fabian Coulthard emerged from the shadows to break a 274-day drought with victory in Sunday's Supercars race at Winton Raceway. Overshadowed by his championship-challenging DJR/Team Penske teammate McLaughlin so far in 2018, Coulthard got his season back on track with a blistering beginning. Despite starting from pole, McLaughlin plummeted from first to seventh to effectively end his hopes of a race win. 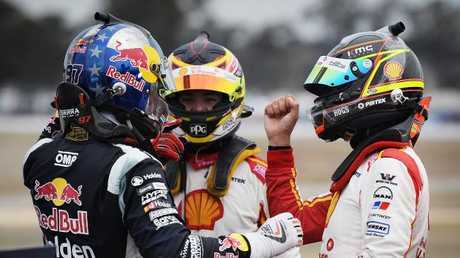 Although he recovered to finish third, McLaughlin's pain was Coulthard's gain as he got the better of his teammate and then held off Holden's Shane van Gisbergen to claim his first Supercars win since last August. "I can't thank the guys enough,'' Coulthard said after recording his 10th career win. A day after Nissan claimed an upset win in the weekend's first race, Coulthard put Ford back on top as McLaughlin faltered. "What happened at the start to Scotty was unfortunate,'' Coulthard said. 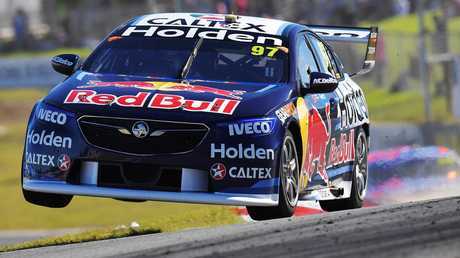 Shane Van Gisbergen gets some air in Perth on Saturday. Van Gisbergen recovered from a poor qualifying effort to finish second after starting the race in seventh position. "I haven't driven that hard for a long time,'' the Red Bull Holden driver said. McLaughlin continued his qualifying blitz by winning another pole to move past Allan Moffat on the all-time list of one-lap victories with 40. In another perfect display of all-out speed, the wunderkind clocked a 1min 19.0200sec to edge teammate Coulthard as the team scored yet another front-row lock out. "It's nice. I always like a good stat," he said. Kiwis filled the podium at Winton. "It's great for the team at Shell V-Power Racing, another front-row lockout. "Hopefully I don't balls it up and we can have a good race. But McLaughlin's joy turned to pain when the race launched to life with the pole-sitter plummeting from first to seventh. In a costly plunder, the Ford driver missed the jump and was swamped by six cars. Coulthard pounced to take the lead and powered away as Michael Caruso and Rick Kelly gave chase in their much improved Nissans. McLaughlin pitted on lap four in a bold strategy play they brought him back into the race. 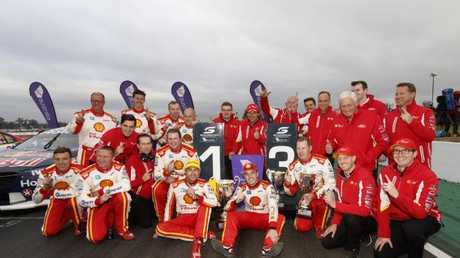 Fabian Coulthard celebrates with his team. Short filling for track position, the championship leader belted out a series of clean-air laps to jump his way back to second following the first round of stops. The championship leader was past by van Gisbergen following the final lap and finished in third. "I have had some pretty bad starts in my time,'' McLaughlin said. McLaughlin leads van Gisbergen by 131 points in the championship race after his lead was narrowed. "I am excited to have a little bit of a break,'' McLaughlin said. The championship resumes in Darwin with the NT round beginning June 15.